If you are a Canadian citizen or permanent resident whose application to sponsor a family member has been refused, you may appeal the negative decision to the Immigration Appeal Division (IAD) of the Immigration and Refugee Board (IRB). Misrepresentation (except if the family member is the sponsor’s spouse, common-law partner or child). You have 30 days after the refusal to appeal to the IAD. 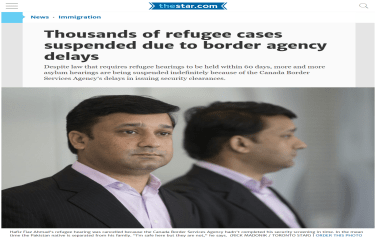 In most cases, a hearing will be held involving two parties: the person making the appeal and the Minister’s lawyer who represents Citizenship and Immigration Canada. A sponsorship appeal to the IAD is a hearing de novo which means that the IAD may consider issues which were not before the visa officer. The IAD is not bound by legal or technical rules of evidence and may make its decision based on any any credible and necessary evidence. The IAD is also bound by the duty of fairness. A participant at a hearing must have knowledge of the main issues in the case, so that he or she can participate in the hearing in a meaningful manner. The IAD may allow or refuse a sponsorship appeal, and must always give reasons for its decision. If the appeal is granted and the original decision is set aside, CIC will continue processing the sponsorship application as it is bound by the IAD’s decision. However, CIC may refuse the sponsorship on other grounds, and this refusal can also be appealed to the IAD. A permanent resident visa may be refused for various grounds including financial, criminality, misrepresentations, and non-compliance with the Act. However, the IAD has the power to grant discretionary relief. When a refusal is found to be valid in law, it is open to the IAD to still allow the appeal both on legal grounds and by taking into consideration the best interests of a child directly affected and humanitarian and compassionate factors that may arise from the circumstances of the case. Either the minister or the sponsor can apply to the Federal Court of Canada for a judicial review of the IAD decision. The Federal Court can either dismiss the application or send it back to the IAD for another hearing. In some cases, the IAD can refer the appeal to an alternate dispute resolution (ADR) process. ADR will only be suggested in appropriate cases. In ADR, the sponsor and the Minister’s lawyer will meet with a dispute resolution officer (DRO) assigned by the IAD to discuss the case. The DRO will assist the parties in reaching a decision by clarifying the issues in the case. If the ADR is successful, there will be no need for a hearing.